Lennie and George speak in broken conversation. George telling, and retelling Lennie about the farm that they’ll have one day. Lennie basking in the glow of this beautiful thought: rabbits of his very own. And Lennie really only desires the rabbits. 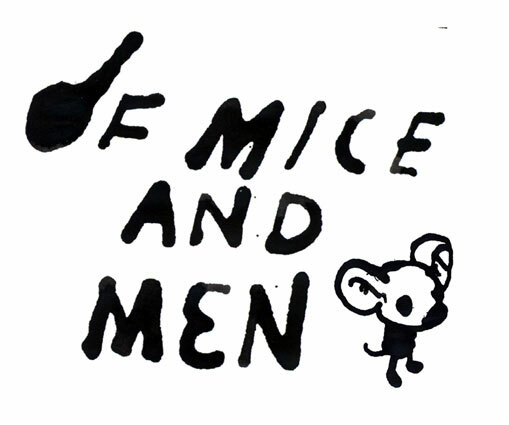 Steinbeck’s Of Mice and Men is a great study in literature…and a great study in people. Lennie’s defense of that which he desires most, rabbits (or the feel of rabbit fur, or the idea of keeping fur around without breaking the necks of the furry, or whatever you deem his deepest desire is), is typical of people, I think. In fact, I would say that this reactionary defense is probably the one lone characteristic in Lennie that is not affected by his cognitive struggles. We defend most heartily that which we desire most. Didn’t the Jesus movement necessarily need doctrine (and the creation thereof) in the face of Donatism, Docetism, Arianism, and other such challenges? But they are rabbits, are they not? Dreams of a possibility that can’t yet be touched. They’re not imaginary; they’re very real. But they’re only real in so far as they point to the Real. If they go further, they become no longer the symbols, the subject, of the desired, but the object of desire. We need a re-traction of doctrine. Doctrine should not give something, but should point to something…point outward, further than itself. We say too much in saying anything, and say too little in saying nothing. But doctrine, for all its benefit, has become a rabbit. This past weekend I watched religious TV on Sunday morning…the bed and breakfast had cable. I flipped through four different religious programs. Some were complete services, some were snippets of “teachings,” some were call-in shows. Very different. And they each reminded me of why I’m a reluctant Christian. These programs are so popular with their lovely memes impregnating the minds of views, both live audience and electronic audience. And this is the mistaken, idolatrous promise (illusory as it is) of doctrine: it gives you something. Instead, the real promise of doctrine is that it points to something…points past itself. Please, Lord, save me from being saved and all the wonky ways we’ve devised to save ourselves from each other, from other doctrines, from, whatever it is we run from. Do we need doctrine? In so far as it points us toward that which is beyond our knowing, yes. Do we need to be saved from doctrine? In so far as it has become our rabbits, mice, soft toys to pen, and hold, and pet, and defend with sticks, yes. This entry was posted in Literary Notes, Peter Rollins and tagged Belief, Church Insiders, Rollins by Timothy Brown. Bookmark the permalink. There’s a ladder and it leads to the top of the cistern. Will we revere the rungs, counting them and polishing them and debating their essential nature… or will we scamper up the ladder, using but then moving beyond the rungs, and leap into the sunshine? There’s a whole box of gear – flashlights with infrared bulbs, UV, x-ray, high-beam, low-beam, polarized too. There are goggles in here as well… to see what there is to be seen. The best doctrines help us see better and more than before… proving more than ever before how restricted our perspective really is. Other ideas confound us. The worst ones tempt us to revel in our pride, pretension and sneering cowardice. to your future prosperity, be it flashlights and night-vision goggles or ladders, wells and sunshine, this posting is on target. Some say yes. Some say maybe. Some are ready to damn you to hell for your mistaken opinions/doctrines. Are you really a reluctant Christian, Pastor Tim? You sound like an eloquent Reformer strapping on his sandals for a long journey. May it bring peace to those who journey at your side.